Each year, after painstakingly decorating all those gorgeous eggs it's sad to see them smashed and scattered, nothing but some shell remnants ground into the carpeting to remind you of their former grandeur. 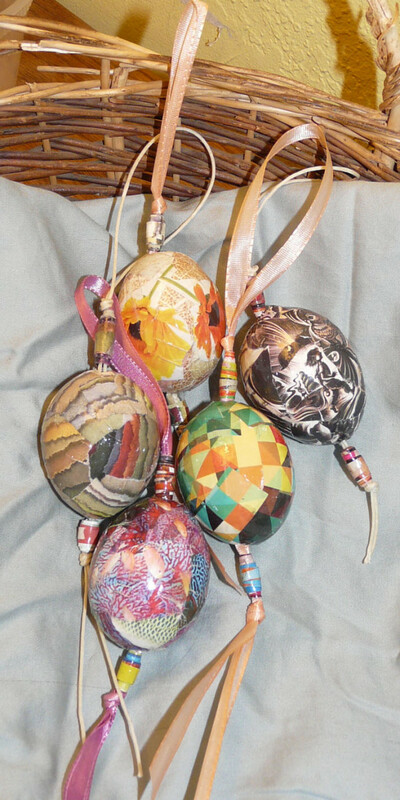 But you can keep these unique and eclectic egg ornaments around long after Easter is gone. You'll need to poke a small hole in each end of the egg. Try to center the hole for best looking results. I used a screw for this, you could use a needle or a drill, but the screw worked well. Twist it back and forth till you get the hole going, be gentle. Once you have pierced the shell, break up the yolk to make it easier to blow out. Blow in one end of the egg until all the insides are on the outside. 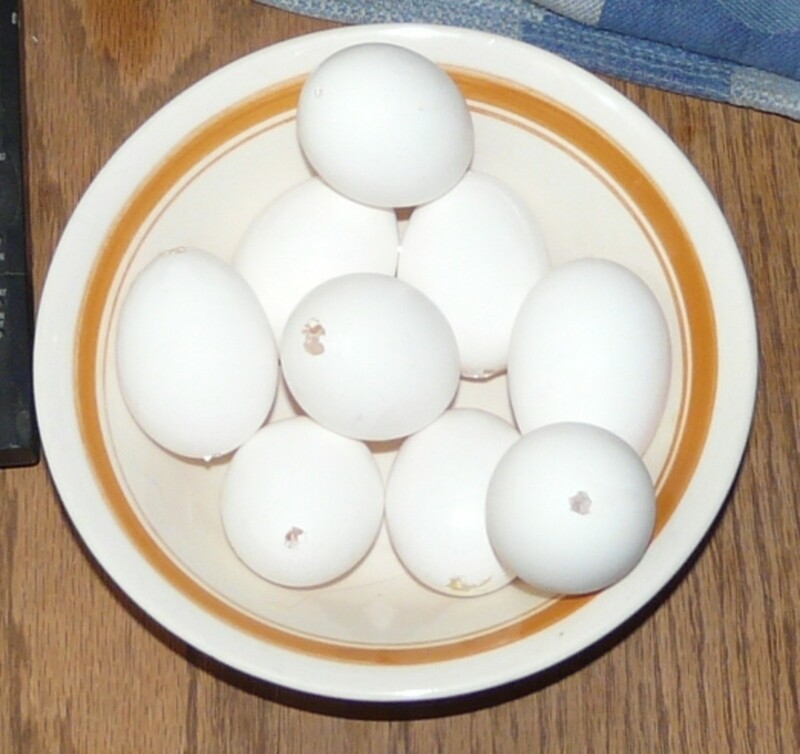 Once the eggs are all empty, I run some tap water through them, and then soak them for a while in a bleach solution. After the eggs are dry I squirt a little white glue inside one of the holes and roll the egg around to coat the inside, that will strengthen your eggshell a little. After I am through decorating I coat the eggs with polyurethane or spray varnish to shine them up and add even more strength. Once the eggs are empty and clean you can decorate many different ways. The only limit is your own imagination. 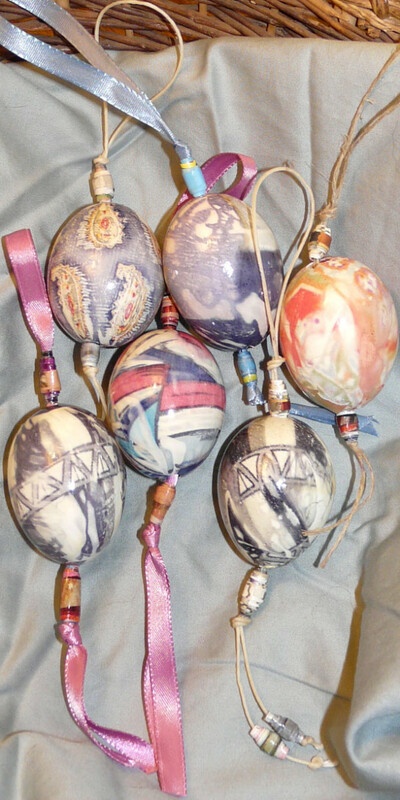 Here I have shown how I made my silk dyed eggs, decoupage eggs and hand painted eggs. This is my first try doing decoupage eggs. One big advantage to them is that they are much less fragile than the others; they won't shatter if you drop them. All you need is some colorful pictures and white glue. I used pictures from magazines for my decoupage eggs. You can do traditional type Easter designs like flowers and bunnies, but I chose to go more unconventional with these eggs. I thinned the glue, about half water half glue, if you thin it too much it takes it longer to get tacky and stick, but it will eventually. Tear or cut the paper into small pieces and dip one piece at a time into the glue solution until it's saturated. Then just stick the pieces of paper on the eggs, overlapping them and smoothing them down with your fingers as you go. Try to get the air bubbles out and the edges to lay flat as much as possible, but avoid too much rubbing, as that will wear out the paper. Once your egg is covered let it dry, then re-coat with more thinned glue. As you add more coats of glue, the paper edges will begin to disappear. You can get some interesting effects using silk to color eggs. For this technique, you must use real silk (at least that is what I've been told; actually, I have not tried any other fabric). 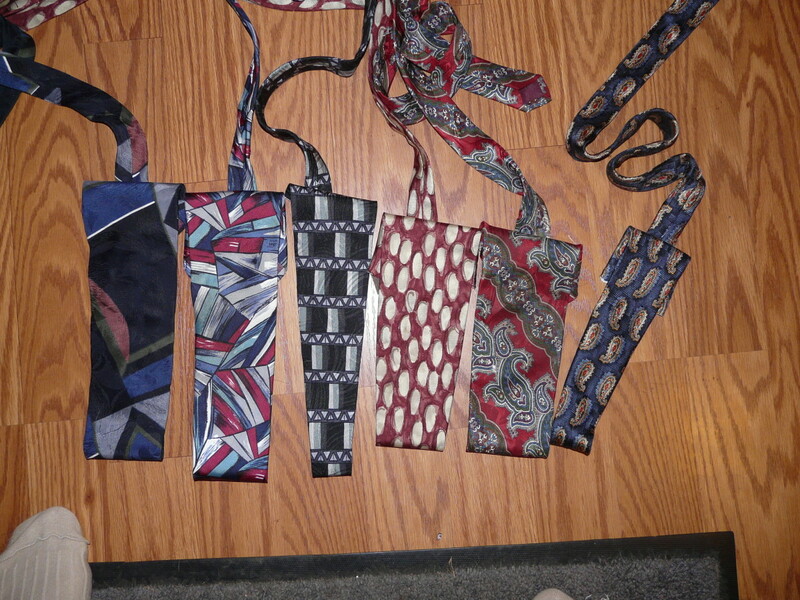 I got some silk ties at a thrift shop, usually you can get them for 50 cents or a dollar, one will make several eggs. Cut a piece of silk that will cover the egg, wrap the silk around the egg, right side touching the shell, then wrap the whole bundle snugly in white cloth and secure at the top with a twist tie or rubber band. You're trying to ensure that the silk is making good contact with the egg for the best transfer, but be careful, hollow eggs are more fragile than intact eggs and if you squeeze too tightly you may crush them. Place your little bundles in a pot of water with a little vinegar added to it. 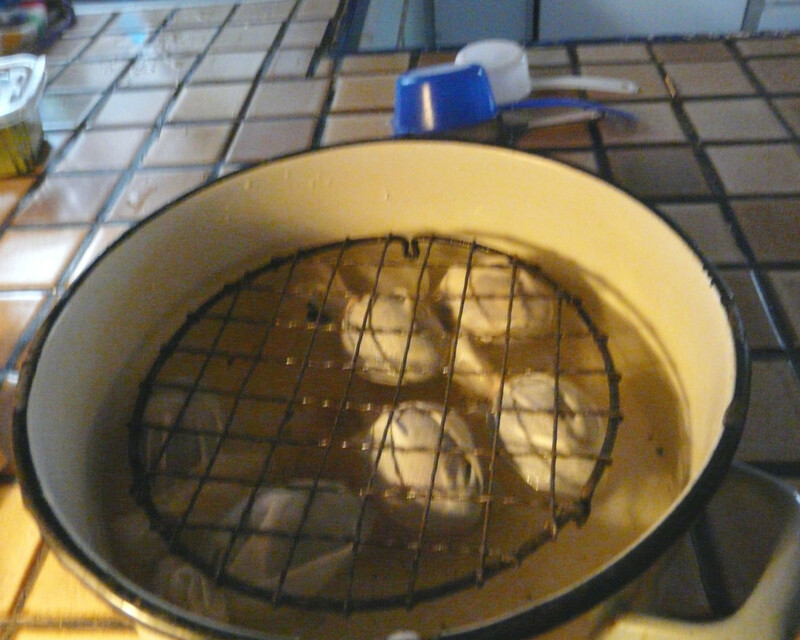 They will float, so I used a cooling rack with a colander on top of it to hold them under water. Before I thought of this I did some without anything to hold them down, and it actually worked OK, I just rolled them around every time I thought about it. Boil them for 20-30 minutes, and then allow them to cool before unwrapping. 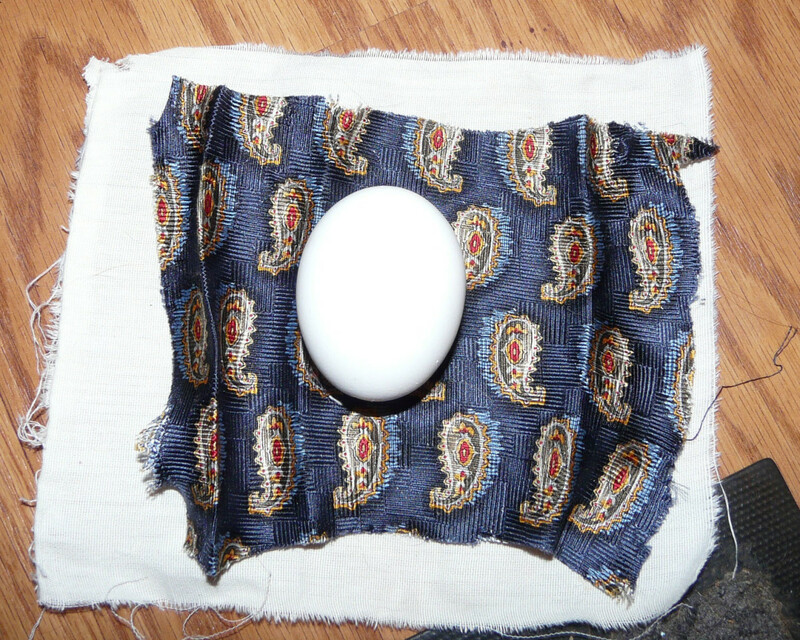 Make sure the right side of the fabric is touching the egg. The eggs will float if you don't hold them down. I used a wire cooling rack. I used oil paints on these eggs, just because I happened to have some around. You can use any kind of paint. Drawing on them with markers is a good option too. After I was through decorating the eggs, I gave all of them a coat of polyurethane to shine them up and make them a little less fragile. I put all of the eggs on bamboo skewers with beads in between to hold them apart whenever I needed to coat them with glue or poly or let them dry between coats. All of the beads I used in this project are paper beads I made myself. They are easy to make, beautiful and practically free! After your eggs are all finished and dry, you are ready to put the hangers on them. You can achieve different effects by varying the type and texture of strings you use. 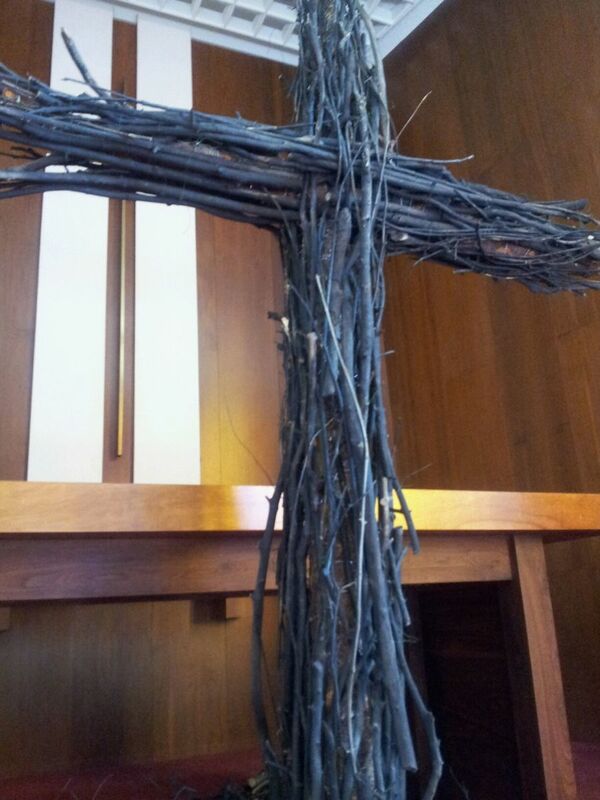 I used ribbon, twine and waxed cord. 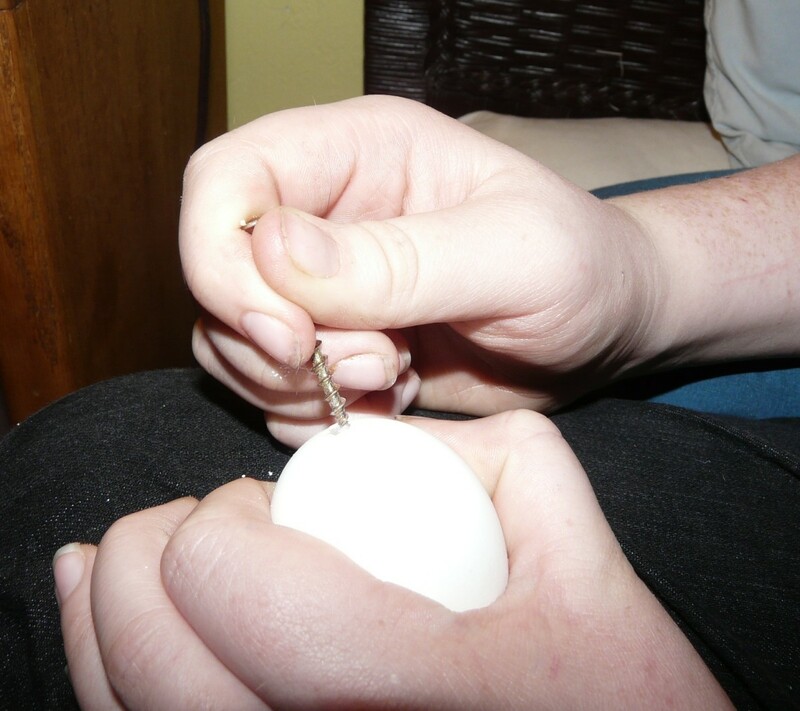 If you use stiff ribbon or waxed cord, you can poke it right through the egg from one hole to the other. For softer ribbon, I looped it though the waxed cord and used the cord to pull it through. If you have trouble getting your hanger through the egg, you could tape it to the bamboo skewer and pull it through with that. A bead on each side of the egg will look pretty and help cover the holes. These ornaments look nice in a window hanging from hooks in groups. 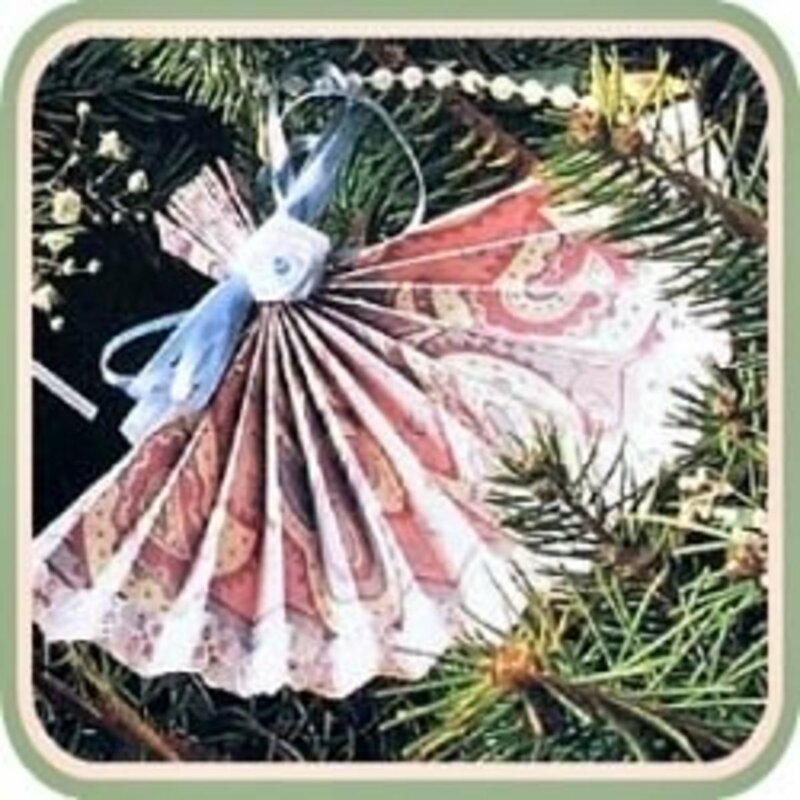 You could make an Easter tree or a mobile to hang your eggs on. I'm sure you can think of lots of ways to display them. 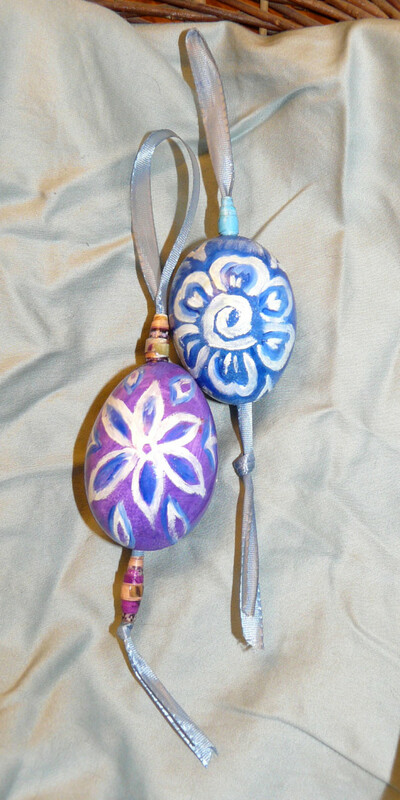 I had fun making these beautiful Easter egg ornaments that I can keep forever. I hope you have fun with them too. When I was a youngster we used to paint eggshells and displayed them on a branch. Reading your article brought back those memories. 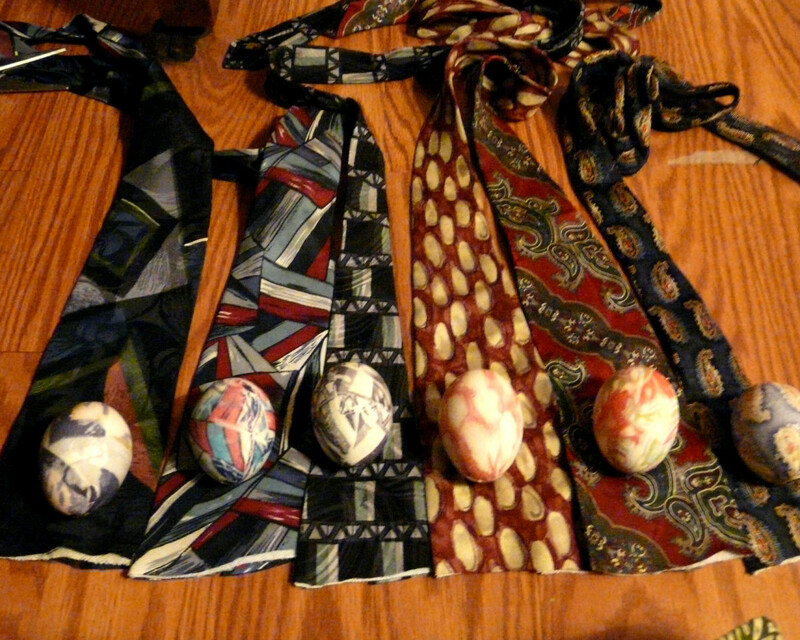 I really like your silk tie idea of transferring patterns to the eggshells. Pinning this to my craft board. I love egg crafts. Nice article! So do i have to poke another hole at the top of the egg? Sherry, I really like this hub. The eggs you decorated are beautiful and your instructions are easy to understand. I am so glad I found this hub, thanks to cloverleaffarm and Rebecca. Wonderful job you did on this . Thank you for this very useful hub. All votes up except funny, and shared. Wonderful! I've hand painted eggs for years. I also hand paint and decoupaged them. Never blew them out though. Always just did the hard boiled thing. You can still hear the inside...lol. Loved the tie dyed ones. Have to try that one. Thanks for the great ideas. Thanks for the generous sharing Denise. Hard to believe this hub's season is almost here again. I saw a Robin in my yard yesterday, and the cherry trees are blooming in town. So very beautiful! I only wish I had the time to make some of these eggs. Thanks for sharing the idea. Thanks for commenting sadie423. 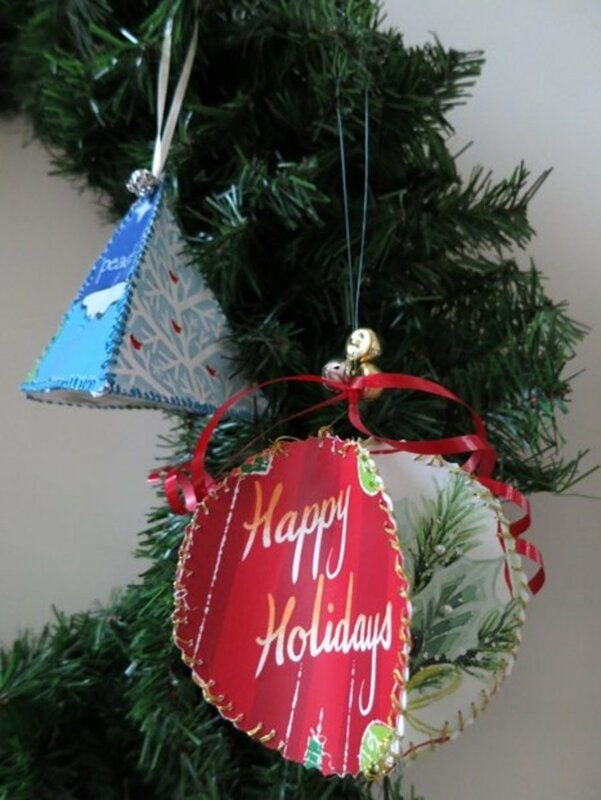 I have a tradition of making Christmas ornaments with my kids, and now grandkids. Maybe I will do egg ornaments this year. I've been making egg ornaments for Christmas for years. I love them and my kids won first prize at the fair with theirs. Yours are beautiful! I have never tried silk dying, but would love to, they turned out really nice. Thank you for your kind comments Maralexa, I got the idea for using the skewers from the tutorial of how to make paper beads at the bottom of my hub. This is a great hub! Your writing is clear, easy to follow. I love the bamboo skewers! I will try these for Christmas too. Voted up interesting, useful, beautiful and awesome. I'm glad you enjoyed it Melovy. I think you could make these at any time, and adapt them to any season depending on how you decorate them Have fun, and thanks for visiting! These are beautiful. I love the water colour effect of the silk ones. I had no idea you could do that. Decoupage sounds like a good way to start and I think my daughters would enjoy that too. We just might not wait till next Easter to try this out! Thanks for all the useful ideas. That is correct, Sherry. Some fabrics hold dye better and the purer the silk content, the easier it will be to get the dye to boil out. Hi I Am Rosa, So you're saying that other fabrics might work but not as well as silk? I've noticed that some pieces of silk work better than others.Thanks for the info, and the comment. Very cool and congrats on Hub of the Day! Silk is probably best for colour transfer because it doesn't keep the dye very well; it "bleeds" the colour. We used to boil the eggs in tea to give them a nice base colour. Thank you AnnaCia, it's been an exciting day for me. You're right RTalloni, the egg is just the canvas, it could used for any occasion, or no occasion at all. Thanks for sharing your thoughts. 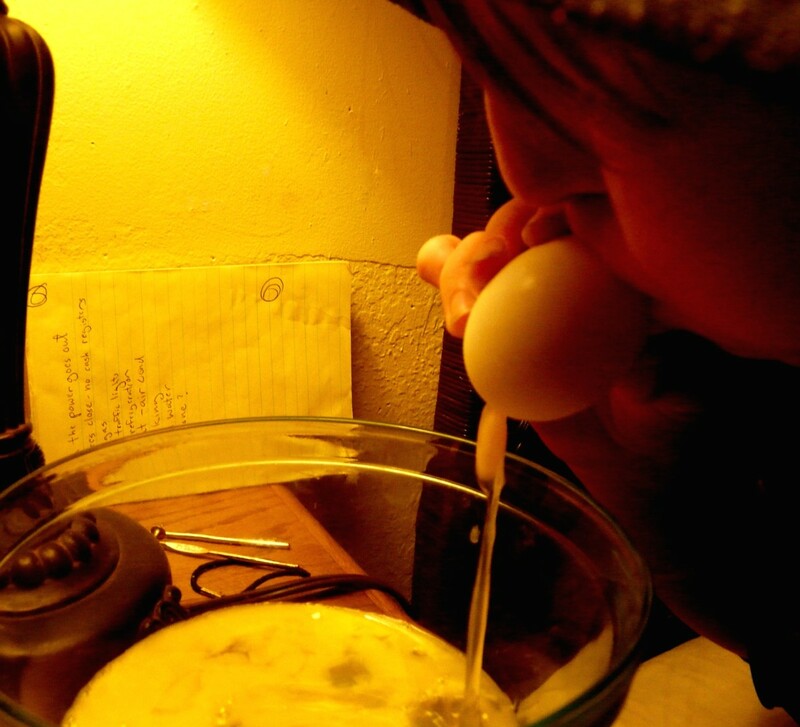 Oh Cerenity, thanks for commenting, yep that's you blowing out the egg, and you took the picture I used of the eggs in the bowl too. Unfortunately I dropped and broke the beautiful egg you painted, along with one of my own. We just emptied out some eggs a few days ago to fill with candy, we just might turn some into ornaments! Great idea! Thank you for commenting Joy M, I think the hand painted ones require more innate creativity, but there are always examples of patterns you can try to mimic. I had really never done decoupage before, but if you pick nice colors the designs really kind of seem to take care of themselves. This is Really creative hub. Congratulations on Hub of the Day and Voted up! Thanks urmilashukla23. I'm so excited about HOTD! I love this hub. I've done hand painted eggs before, but never thought to do decoupage or silk transfer before. Thanks for the ideas. Great Hub! This is a well-deserved Hub of the Day. Love all your beautiful egg designs! You make the traditional Paas coloring kit look so 1990. :-) Well done! coffeegginmyrice, enjoy your lunch. 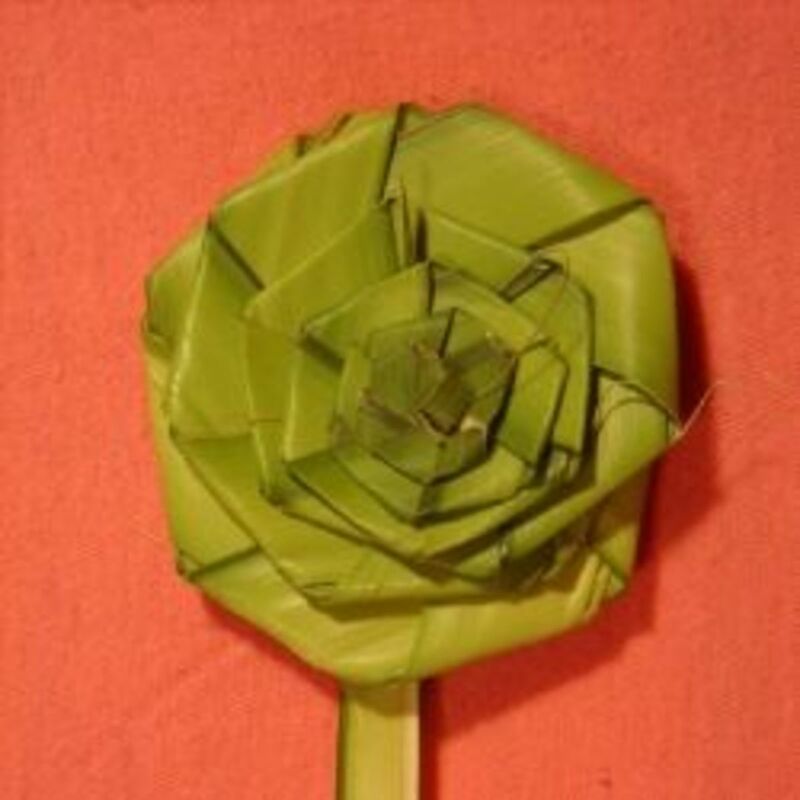 You're right that all of these techniques could be adapted for Christmas, and make unique and personal gifts which could also be quite inexpensive. Thanks homesteadbound. Egg cartons come in handy a lot during this process. I hate to see you cut up your antique silk tirelesstraveler. Silk ties at the thrift store are super cheap. Thank you so much moonlake. So that was you Pinning me. 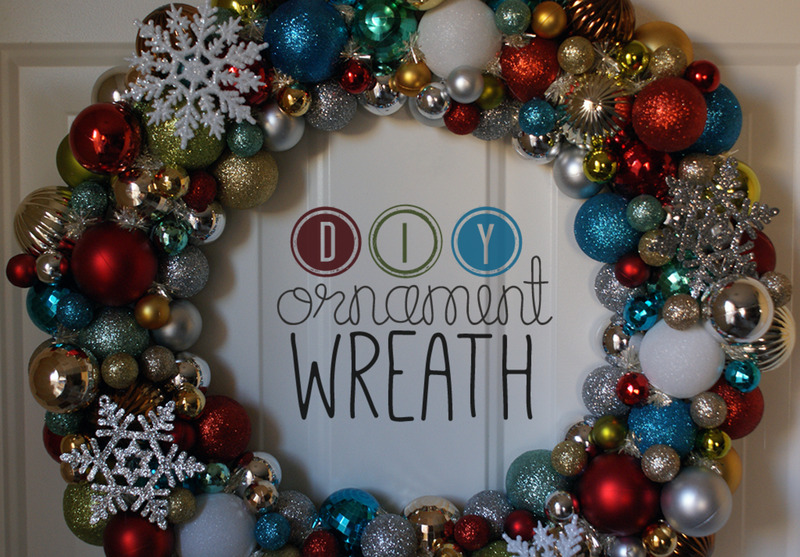 I have gotten a ton of traffic from pinterest on this hub, I think crafts hubs are good candidates for it. Feel free to pin my hubs, I am not a professional photographer, and my photos are to draw people to the hubs. 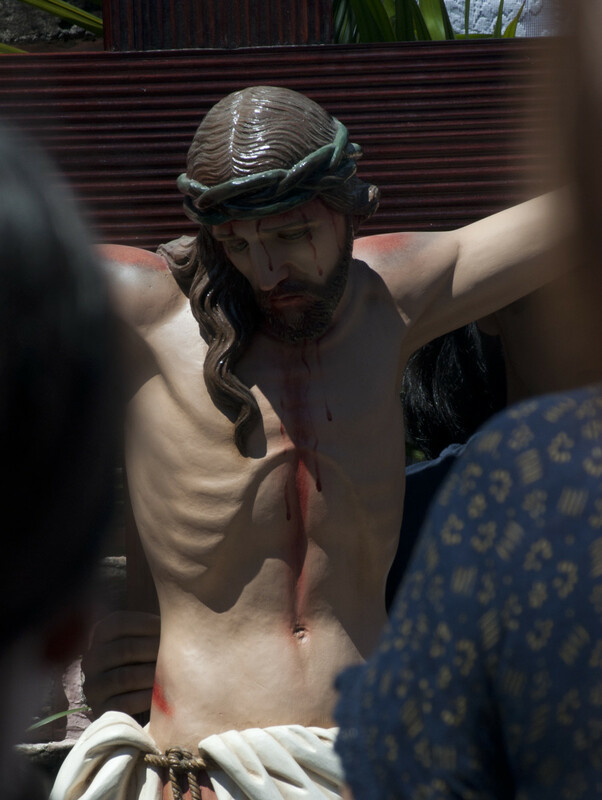 ChristinS, thank you. 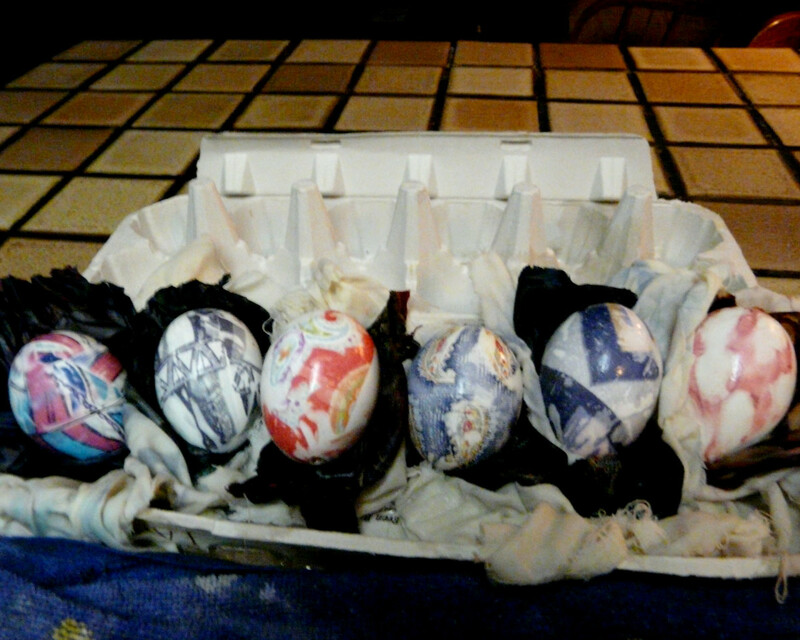 The decoupage eggs are my favorites, even though they are the most work. Stephanie, Necessity is the mother of invention, it's true. 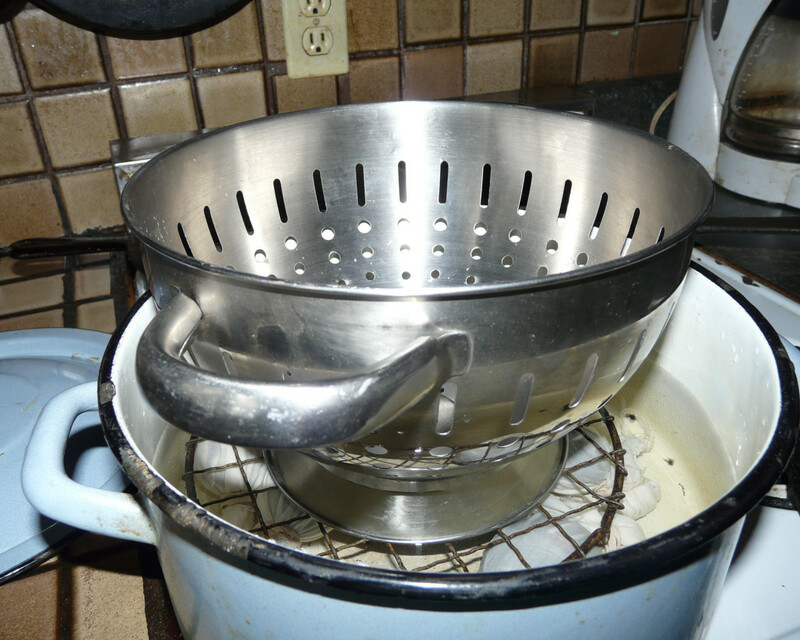 I needed some way to dry the eggs without having them stick to anything. The bamboo skewers were perfect for that. Thanks for the vote and the pin. Pinterest has been great for this hub. Thanks tammyswallow, I'm certainly not the first to do silk-wrapped eggs. But I'm glad I could introduce them to you. Thank you for the congrats. Well, I'm no competition for Martha I'm afraid. But I just use what I have on hand. I think I saw where she uses a drill, and has some contraption for blowing them out so you don't have to use your mouth. I guess it's a good way to monetize something people can do for free. pstraubie48, Thanks for the congrats. I don't really consider myself the 'craftiest.' I just keep trying. I was half reading your hub awhile ago and have to leave for the kitchen. My eggs are shaking in the pot of boiling water. Now, I'm back. Oh, but it is for my lunch, not for Easter decorating, hahaha! 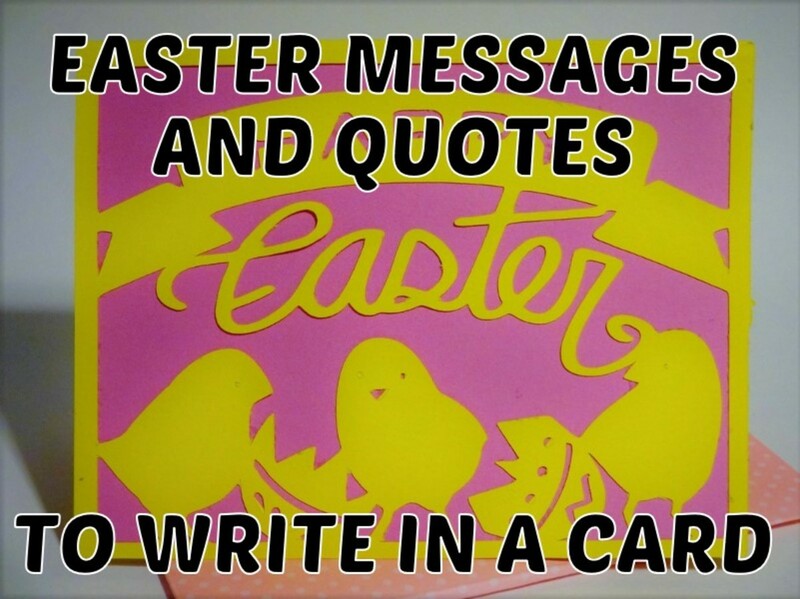 I love your ideas in this Easter egg craft. They can also be great for the Christmas tree or to give-away as gifts (4 in a box), with a personal touch and labour of love! Voted up! Cheers! These are very beautiful. I have not seen the silk application before so that was very intriguing. 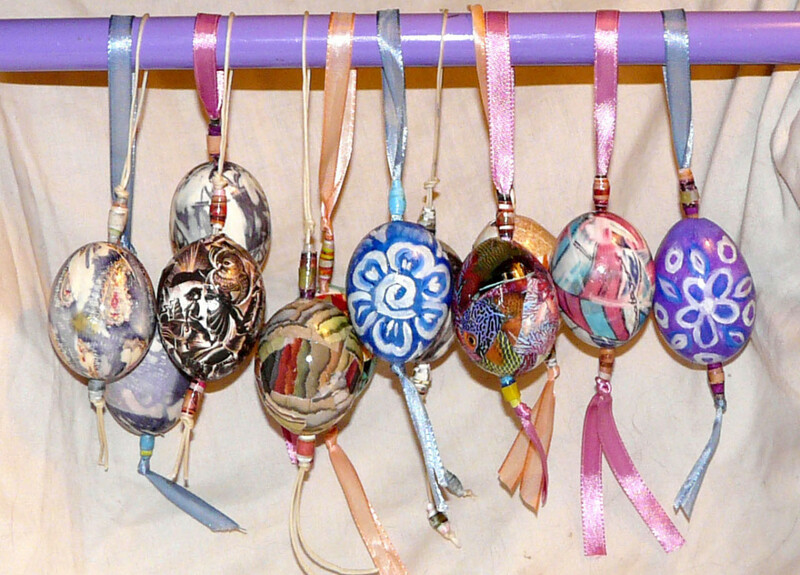 You have created a beautiful hub with lots of great information on how to create these incredible easter ornaments. A good way to store for next years use could be in the egg cartons they came out of. Congratulations on your well-deserved Hub of the Day! 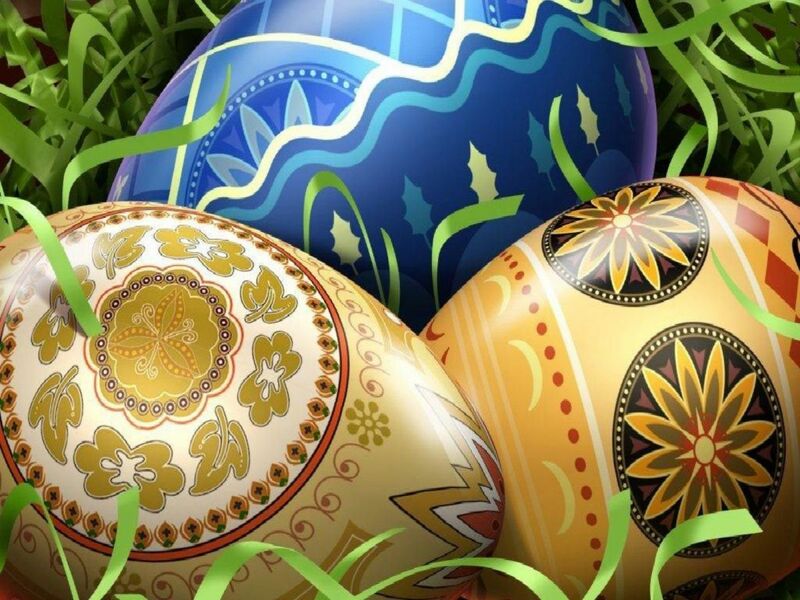 The eggs are beautiful and artistic. I love the idea of using silk ties to transfer colors to eggs, and drying them on bamboo skewers is something I never would have thought to do. Great hub! Voted up and pinned! These are gorgeous! I never saw a silk wrapped eggs. Congratulations on you hub of the day. This is stunning! Thanks for the great ideas, and congrats on Hub of the Day. I was watching Martha Stewart yesterday, and she used a handy tool for making a hold in the egg. Made the job easier, she says. I'm trying your ideas. I voted this UP, etc. Hi Sherry, you are so right about how we take time to create eggs that are just gone then so soon after. The idea of making eggs to last much longer is a great one. I liked the ideas you gave, and this hub came at a perfect time as I was just thinking about wanting to learn new ideas to decorate eggs for the long term. Great hub. silk-dyed eggs is so neat. I have never seen that before and easy to do. Something I could do. Loved it. Voted up and Shared. Thank you bizwin. I've been working on this for a while. Taking the pictures was actually the most challenging part. That looming Easter deadline finally made me get it together. These are great easter eggs decoration. I wish i've seen this some weeks back when my girl's school was doing an easter egg competition. Voted up. Wow! 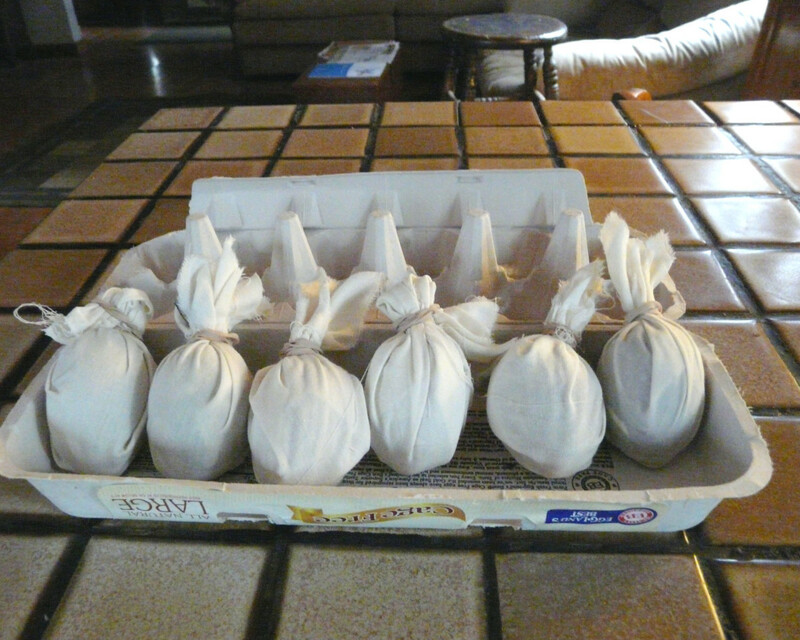 This is an extremely creative and economical idea in creating Easter eggs and preserving them! Your egg-creations are amazing! The step-by-step procedure in creating silk-dyed eggs are detailed and well-explained with clear pictures. Look like you had a happy and fun-filled Easter! Thanks for SHARING. Useful, Awesome & Beautiful. Voted up and Socially Shared. This sounds fun, Sherry! When we were kids, my mom would dye eggs with onion skins, too. I want to tell my daughters and daughters-in-law about your techniques.